• The National Planning Commission. • The pattern of consumers’ spending. • People advertising their wants. • Which one of the following statements is correct? • South Africa has an unlimited supply of natural resources. • Wealth and income are synonyms (have the same meaning). • The N1 highway between Cape Town and Johannesburg is an example of a capital good. how to allocate their resources. • South Africa has a pure market economy. Read the following statements and then answer the question that follows. • A study of money, banking, capital formation and wealth. • A study of how limited resources are used to satisfy unlimited human wants. • A study of the application of scarce means to a multitude of human wants. 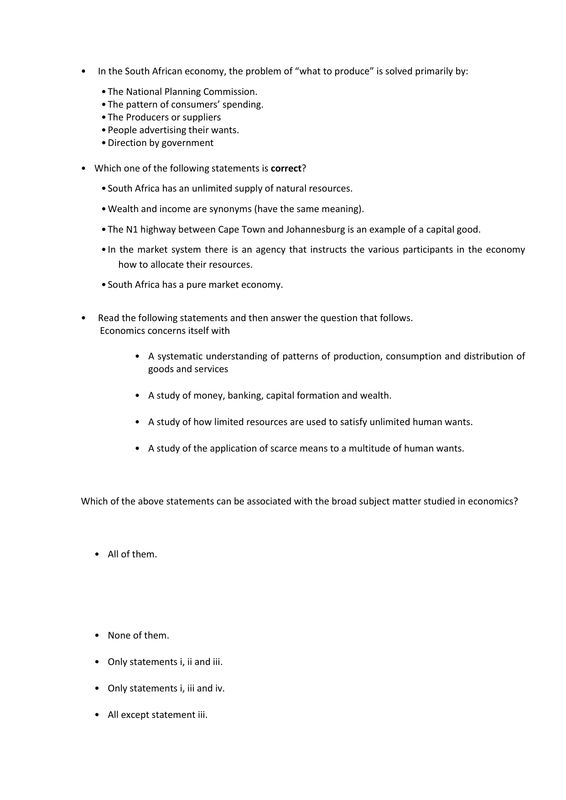 Which of the above statements can be associated with the broad subject matter studied in economics? • Only statements i, ii and iii. • Only statements i, iii and iv. • All except statement iii. Prices to increase, output to increase and efficiency to increase. Prices to increase, output to decrease and efficiency to decrease. Prices to decrease, output to increase and efficiency to increase. Prices to decrease, output to decrease and efficiency to decrease. • Labour services are not transferable from one person to another. • Labour is always rented rather than sold. • Labour is embodied in people and is therefore homogeneous or standardised. • Labour is not traded at the best price on a daily basis. • The labour market is subject to a wide range of non-economic factors. • Employer-friendly, flexible labour market policies. • Worker-friendly, stable labour market policies. • Perfectly competitive labour market policies. What is the average cost of producing 5 units? 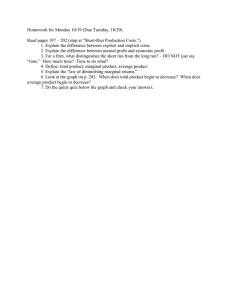 What is the marginal cost of the fourth unit? 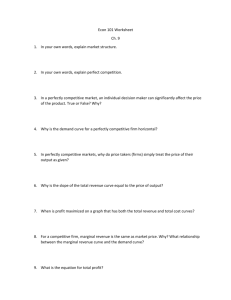 Which one of the following commodities will have the lowest price elasticity of demand? 1200 café lattes per day. Use this information to answer Questions 12 and 13. 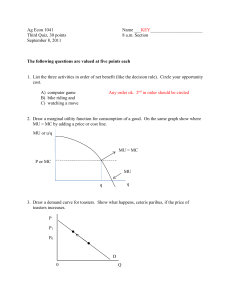 What is the price elasticity of demand for café lattes (using the arc formula)? 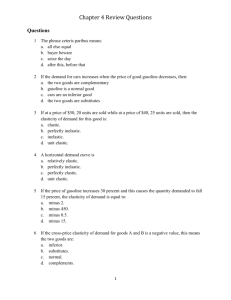 How would you classify the demand for café lattes, as calculated above (refer to question 12) ? Mary’s demand for McDonald’s hamburgers is likely to be more price elastic than Sipho’s. Sipho’s demand for McDonald’s hamburgers is likely to be more price elastic than Mary’s. Mary’s demand for all hamburgers is less price elastic than Sipho’s. Sipho’s demand for all hamburgers is more price elastic than Mary’s. cream can increase their total revenue by raising the price of ice cream. 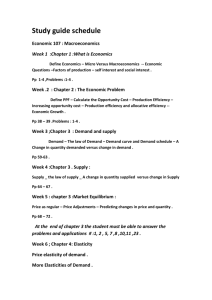 • The price elasticity of demand stays the same at each point along a linear demand curve. university education demanded, then the demand for university education is price elastic. lower the total revenue of the suppliers of bread. 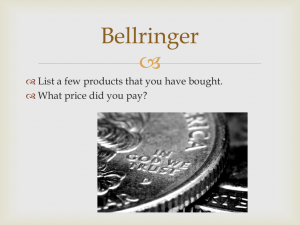 A consumer is in equilibrium when his or her average utility is at a maximum. 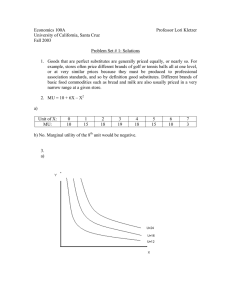 A consumer is in equilibrium when his or her marginal utility is at a maximum. A consumer is in equilibrium when his or her weighted marginal utility is at a maximum. of a particular good (eg ice cream). the table to answer Questions 17 to 19. Marginal utility of the second traditional beer is 270 utils. Average utility of 3 traditional beers is 90 utils. Average utility of 5 traditional beers is 80 utils. Total utility of 7 traditional beers is 1020 utils. what can we say about the consumer? The consumer should purchase more of A and less of B. The consumer should purchase more of B and less of A. The prices of goods A and B must be equal. The consumer cannot increase her utility. Rise at a constant rate. Fall at a decreasing rate. Rise at an increasing rate. Fall at a constant rate. The consumer must be wealthy. Units of the good must be consumed over a specified period. The good must be edible. The first unit consumed must yield a very high marginal utility. There are no specific requirements for the law to operate. • Which one of the following statements is incorrect? costs R10 per unit, is 50. To achieve equilibrium, John has to consume more food and less drink. equilibrium if he purchases this combination. • If a marginal value is negative, the corresponding total value decreases. 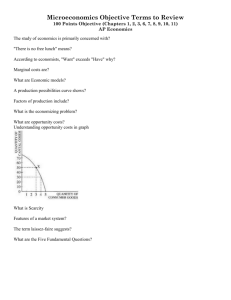 • The law of diminishing marginal utility is sometimes called Gossen’s first law. • Negative utility is called disutility. The transitivity of consumer preferences. the goods have equal ratios of marginal utility to price. the goods generate the same total utility. the goods are of the same price. the goods have equal ratios of price tot total utility. the goods have equal values of marginal utility times price. • The price of fish. • The price of meat. • Thembikosi’s indifference map with regards to the consumption of fish and meat. • The amount that Thembikosi has available to spend on fish and meat. marginal cost of output associated with hiring the sixth worker? Is equal to total variable cost per unit of labour. 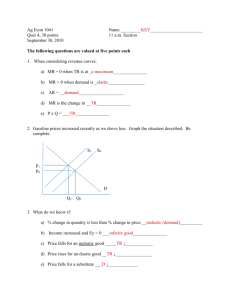 Is equal to total variable cost. month. If its average fixed costs are R800 per month, what are its total costs per month? The average product of labour is decreasing. Total product is increasing at an increasing rate. The marginal product of labour is increasing. 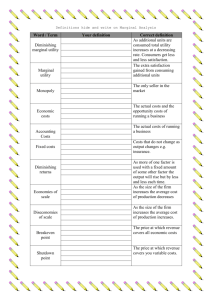 The marginal product of labour curve is positively sloped. The firm is experiencing increasing marginal returns. The average fixed cost curve is rising. The average fixed cost curve is horizontal. The marginal cost curve is falling. month. If its average fixed costs are R350 per month, what are its total costs per month? • Complete the following table and use the data to answer the 35, 36, 37 and 38. • A small business is more likely to keep close control on costs than a large firm. • SAB Miller employs many people, whereas perfectly competitive firms are ownermanaged. The firms are earning zero economic profits. The firms are earning normal profits. The firms are making economic losses. The firms are operating at minimum AC. All of the above hold. The demand curve for a perfectly competitive market is perfectly elastic. If a perfectly competitive firm maximises total revenue, it maximises profit. Perfectly competitive firms that make no economic profits should shut down. Perfectly competitive firms can make economic profits in the long run. Increase its output irrespective of the type of firm it is. Decrease its output irrespective of the type of firm it is. Which of the following would we NOT associate with a natural monopoly? Increasing average costs as the scale of operation increases. A large scale of operation. The ability to influence market price. Which of the following will NOT shift the market supply of labour? A change in the size of the population due to a change in birth or death rates. A change in the labour force participation rate (for example, of women). Is an investment undertaken by an individual. Imposes both direct costs and opportunity costs on the individual. Would be expected to increase an individual’s productivity in employment. Would be expected to increase an individual’s earnings. • The labour market is an important factor market in the economy. • The cost of labour is determined solely by the wages and salaries paid to workers. • Wages and salaries are also an important demand factor in the economy. • Productivity is an important determinant of the cost of labour. • There are significant differences between the labour market and the goods market. Which of the following is an example of a capital resource?